55-3284 with fellow shipmates, at Brookley AFB., Mobile, Alabama. • 55-3284 United States Army. Delivered on 29-Jun-1956. Assigned to the 2nd Aviation Company, Fort Riley, KS. May-1957. To Brookley AFB, Mobile, AL. Here the aircraft was prepared for embarkation from Brookley Ocean Terminal and was loaded on board the USS Tripoli (CVU-64), serving with the Military Sea Transportation Service. This set sail for Bremerhaven, Germany, arriving on 16-May-1957. Jul-1959 Served with the 2nd Aviation Company and the platoon based at Verdun in France, flying from Royellier AAF. Jun-1962. Coleman Barracks Depot, Mannheim, Germany as a maintenance float. Possible gap in Army history unless it remained at Mannheim. May-1964. Arrived at the Army Aeronautical Depot Maintenance Center (ARADMAC), Corpus Christi, TX where it is confirmed as into storage..
Nov-1966. Returned to the United States for overhaul at the Sharpe Army Depot, Stockton, CA. Oct-1967. Returned to Vietnam for the 18th Aviation Company. Accident: Phan Thiet, Vietnam. 18-Jun-1968. The crew experienced a crash landing at Phan Thiet as they tried to land an Otter that had oil splashing over the windshield. The aircraft entered the traffic pattern too high and overshot the runway. Their last resort was to make a downwind landing but they undershot that attempt and crash landed short of the intended touchdown point causing major damage to the aircraft. Jun-1968. To 388th Transportation Company, Vung Tau, Vietnam for disposal. Deleted from Army Inventory Aug-1968. The wrecked Otter was handed over to the 388th Transportation Company at Vung Tau for disposal. It was deleted from the Army inventory in August 1968 as “broken up for spare parts”. 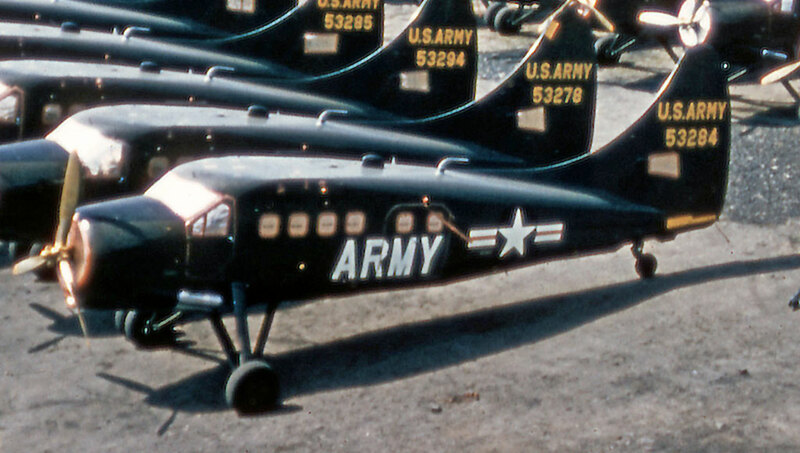 Otter 133 was delivered to the United States Army on 29th June 1956 with serial 55-3284 (tail number 53284). It was assigned to the 2nd Aviation Company, Fort Riley, Kansas which later deployed to Germany, then France (as described in relation to Otter 124). 53284 served with the 2nd Aviation Company platoon based at Royellier AAF, Verdun, France until December 1962, when it went to the depot at Coleman Barracks, Mannheim, Germany as a maintenance float. Details of its subsequent Army career are unknown until it arrived at the ARADMAC Depot, Corpus Christi, Texas in May 1964, where it was put into storage. In December 1965 it was transported from the Depot to Vietnam where it joined the 56th Transportation Company as a support aircraft, replacing 53273 (119). 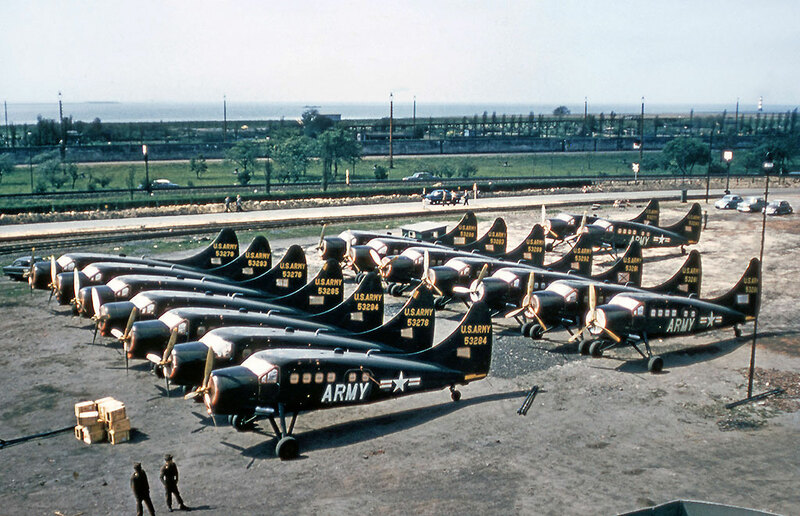 It continued flying with the 56th until November 1966 when it was returned to the United States for overhaul at the Sharpe Army Depot, Stockton, California. It then returned to Vietnam where in October 1967 it joined the 18th Aviation Company. It flew for the 18th until June 1968 when it was involved in a crash. The incident is described in the unit history: “Lt.Hunt and CWO Whigham experienced a crash landing at Phan Thiet during June as they tried to land an Otter that had oil splashing over the windshield. The Otter entered the traffic pattern too high and overshot the runway. Their last resort was to make a downwind landing but they undershot that attempt and crash landed short of the intended touchdown point causing major damage to the aircraft”. The wrecked Otter was handed over to the 388th Transportation Company at Vung Tau for disposal. It was deleted from the Army inventory in August 1968 as “broken up for spare parts”.